Geri-Fit: Strength Training Workouts that Work! Applications for the $6.3M CDSME grant, HHS 2019-ACL-AOA-CSSG-0311, Empowering Older Adults and Adults with Disabilities through Chronic Disease Self-Management Education Programs, is now officially closed. Geri-Fit would like to thank all the counties, Area Agencies on Aging, and non-profits that selected our program as their chronic disease self-management support program. We wish you much success with your applications! The award date is scheduled for May 1, 2019. Geri-Fit® is a tier III (highest level) evidence-based health promotion program and chronic disease self-management support program. Designed exclusively for older adults, Geri-Fit helps rebuild strength that's been lost through the aging process to help ensure a higher level of function as we continue to age. The workout is considered a "progressive resistance exercise program" meaning that once the participants have built up enough strength and endurance using a set of 2 or 3-pound dumbbells, they can graduate to using heavier dumbbells weights in order to become even stronger. 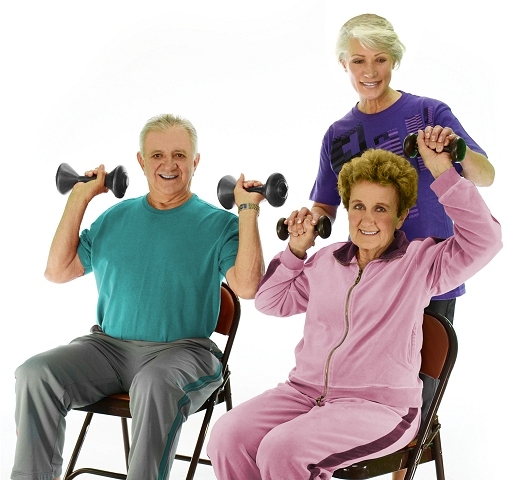 In essence, Geri-Fit is bodybuilding for seniors! A typical Geri-Fitter will work up to using a set of 4 or 5-pound dumbbells within a year's time. The Geri-Fit physical activity program also incorporates stretching and range of motion exercises, stability and balance training for fall prevention, cardiovascular activity for heart health, and gait exercises to help improve walking. Want to see what it's all about? Here's a brief video from youtube that shows an advanced version of Geri-Fit. Becoming stronger isn't the only positive outcome that's achieved with Geri-Fit. Older adults will also see an improvement in balance and functional capacity which will help lessen their chance of falls. Other benefits are an improvement in activities of daily living such as carrying groceries, being able to get in and out of a car, standing up from a seated position, picking up a pet, walking up and down stairs, and just being able to walk freely again. A noticeable improvement will also be seen in your mood. Most participants experience decreased anxiety and depression within just a few weeks of starting the Geri-Fit program. Geri-Fit is an ideal ongoing evidence-based self-management support program for chronic disease management, i.e., pre-diabetes and type 2 diabetes, heart disease, arthritis, behavioral health, obesity/weight loss/weight management, as well as chronic pain management. Geri-Fit also provides continued benefits as a regular, ongoing balance and fall prevention exercise program for graduates of the A Matter of Balance fall prevention course. 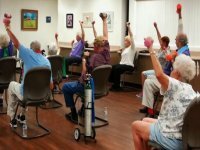 Geri-Fit is especially beneficial for those that are over the age of 75, however, any senior age and fitness level can participate. We suggest to everyone to just work out at their own pace and do what they can! 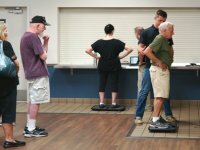 In addition to previous published studies involving the Geri-Fit program, this February 2017 issue of Clinical Interventions in Aging reported that older adults age 65+ that participated in the Geri-Fit top tier evidence-based health promotion program showed an 80.8% improvement in balance over a 90-day period. To the left is a graph showing the decrease in postural sway, a strong fall risk indicator. The higher the number, the higher the fall risk. Geri-Fit substantially reduced the fall risk. 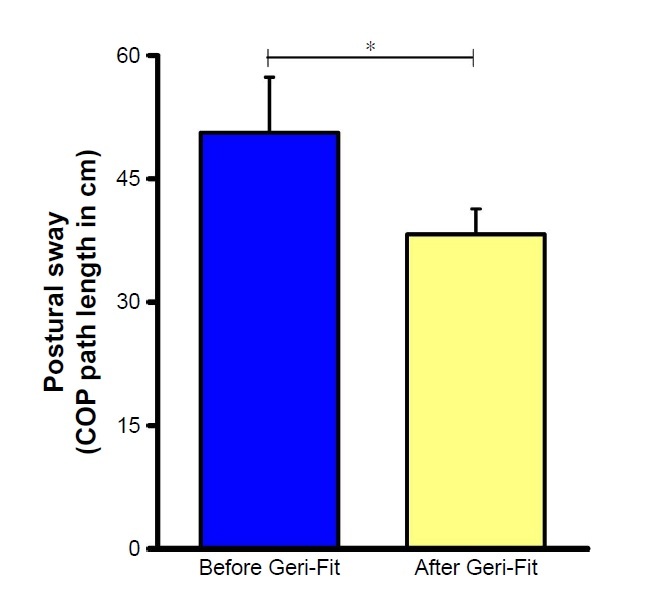 More measurable outcomes can be learned from these additional studies that used the Geri-Fit intervention. The Geri-Fit® evidence-based health promotion / disease prevention program is recognized by the Administration on Aging (AoA) and the Administration for Community Living (ACL), a division of the U.S. Department of Health and Human Services at meeting the highest criteria (tier III). 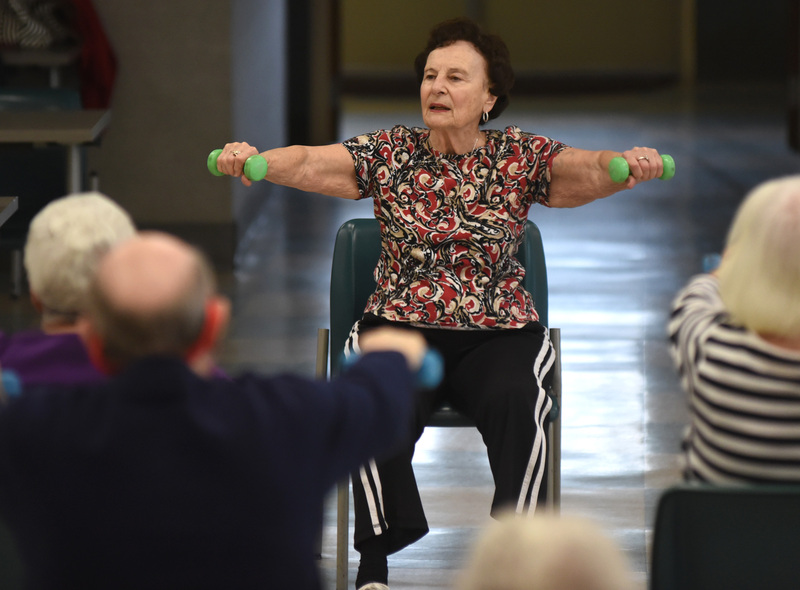 Geri-Fit is listed on the National Council of Aging's (NCOA) suggested physical activity page as well as the Title III-D Cost Chart (see page 18). Federal funding under Title IIID OAA (Older Americans Act) is available to senior centers, non-profit organizations, faith-based organizations, Area Agencies on Aging and other eligible entities who want to implement tier III evidence-based health promotion programs, chronic disease management support programs, and lifestyle change programs for their communities. For more information on how to get the Geri-Fit® All Prevention program offered at your senior center, YMCA, library, or faith-based organization, use the Contact Us link or call the number below. GeriFit: Aguirre Building, 505 Jefferson St.
GeriFit: Shelby Senior Services, Inc.